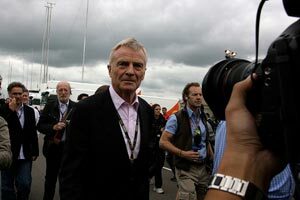 Max Mosley says he will not stand again as FIA president and wants Jean Todt to succeed him. Mosley said he was grateful for all the messages he received from clubs around the world wanting him to stay on, but said that he will not be a candidate. Mosley will be 70 next year. Former Ferrari team principal Todt is yet to officially announce his candidacy but has been campaigning for some time. Former World Rally Champion Ari Vatanen has also said that he wants the job. In F1 circles Vatanen is much more popular than Todt as the latter has a reputation for commercial pragmatism, rather than being a man who has shown much belief in the ideals of sport. The best example of this is Todt's fixation on allowing Michael Schumacher to win races for Ferrari , subjugating his team-mates - often contractually - but there is a much earlier example at Todt's non-sporting attitudes back in the late 1980s when he tossed a coin to decide the Paris-Dakar Rally six days before the end of the rally. That deprived Jacky Ickx of any opportunity to win the event. Instead Todt decreed that Vatanen would take the win. The choice of Todt will not be popular in F1 circles where, despite his success, he was never popular.